You could be forgiven for thinking that the fluffy plumage and designer ear muffs worn by the Silkie are a recent showcase of the breeders art but, in fact, the Silkie is one of the most ancient breeds we know today. It is thought they may date back as far as 2000 years with origins in either China or South East Asia but there is certainly an account of a ‘furry chicken’ from this region documented by Marco Polo in the 13th Century. So different are they in appearance to other breeds that as they were introduced in the West myths were spread that they were actually chickens crossed with rabbits. The characteristic plumage is a consequence of the feathers having no functioning barbules or hooks to hold them together. While this creates the attractive and unusually soft plumage it does also mean that, whilst they are accomplished runners and jumpers, Silkies are unable to fly. Silkies have several other unusual physical characteristics with all colour varieties displaying the already mentioned blue earlobes, 5 toes as opposed to the usual 4 and completely black skin and bones as well as dark coloured meat. The other personality trait of the Silkie is that the hens are very prone to going broody, which has lead to them being used to incubate the eggs of other less maternal chickens as well as other types of poultry and game birds. This said, they can still present you with up to 150 tinted eggs a year. 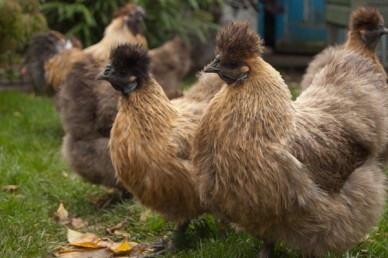 Silkies are one of the most commonly kept pet breeds due mainly to their exceptionally affable temperament. This coupled with the fact that they fare well in relatively small area means that they are perfect for backyard keepers. Unfortunately this docile and sociable nature does mean that they are prone to being picked on by more dominant breeds so it is advisable to keep Silkies as a group of at least 3 separate to other breeds. 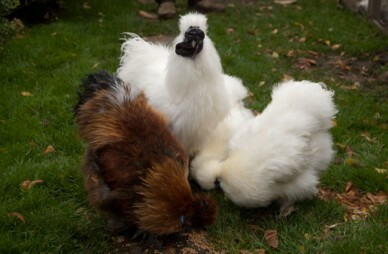 Often thought of as a bantam breed, Silkies are actually classified as a large, light, soft feather. The breed does have a bantam variety with the tiny miniature version weighing in at a suitably ‘bantam weight’ 500-600g or approximately a third the weight of the large variety. There is a wide range of colours available to choose from with white, black, gold, partridge and blue being the standard and non-standards including red, cuckoo, blue splash and chocolate. Be aware that any red in the comb or wattles, greenish or yellowish feet and any hardness in the wing feathers, while not a particular issue in pet birds, are all defects from the standard and may suggest cross breeding. Your housing will need to be dry and sheltered as Silkies, as you might imagine, get waterlogged very easily it is also worth considering investing in open feeders and drinkers which leave room for the pronounced head feathers. Shelter is also an important consideration in the summer, especially if you have white Silkies, as the sun can cause a yellowing effect on the feathers. Silkies have no special dietary requirements so layers pellets supplemented with whole wheat in the evening feed is perfectly acceptable. Mixed corn containing maize is another culprit of yellowing plumage and legs so if you are planning to show your birds this should be avoided. There are a few specific health issues you should be aware of too. A Silkie’s cranium never fully closes up which means they can be more susceptible to head injuries than other breeds, they are also particularly vulnerable to Marek’s Disease although well bred examples will be more resistant to this and other chicken ailments. They can also suffer from respiratory problems which is why low dust bedding is recommended. When buying try to find a breeder who is a member of The Silkie Club of Great Britain as they are likely to have a more in-depth understanding of the requirements of raising this breed. Be wary of guaranteed sexed Silkies younger than 12 weeks as they are notoriously difficult to tell apart even for some time after this with black and white birds remaining ambiguous for anything up to six months. A good Silkie will cost in the region of £30-£40 to buy. This breed really does get the thumbs up as a great all rounder, they make excellent pets, breed easily and they even enjoy being pampered in preparation for showing. If you were thinking of taking on Silkies before reading this we would have certainly have no hesitation in recommending this attractive, good natured and easy to keep breed to anyone. 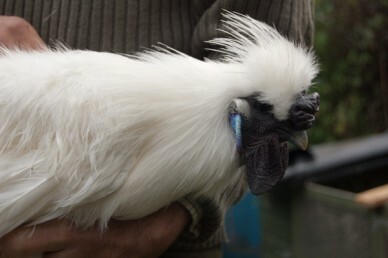 Alan and Karen Cooper have shown and bred Silkies for six years. Hi there, can you breed a large silkie with a bantam size silkie. He’s not that much bigger then them. Any help please. H Darren, yes you can happy interbreed the two. It has been going on so long now that it is often difficult to tell them apart now as you say yourself. A bantam by definition should be one quarter the size of a large fowl but with breeds such as Silkies especially you find more and more interbreeding has led to a proliferation of sizes. Are they a small large fowl or a big bantam? Cockerels are notoriously amorous so to give each of hens a rest from his attention I would suggest between 3 or 4 as a minimum but he would still happily service five or six without any problem. What a nice article about Silkies. When you mention the standard colors, is “gold” the same as what is being called “buff”? Also, why do you see some with the crest completely covering their eyes and others with a clean face and mask look around the eyes?? Which is standard for showing? Or, are both accepted? Hi Linda, thank you for your comment. Yes, the ‘Gold’ colour is very similar to what may be called buff in other breeds. The crest and large walnut comb is found on the male birds, females do not display this characteristic. Hi I live in Wiltshire Uk and just started to have silkies. They are adorable. I have 5 black rooster, 2 hens and 2 young hens (daughters). And 4 white. What will I end up with if I mix them up and hatch out in spring? I enjoyed reading on this site, thank yoh. Laura, chances are you will end up with just visual black and white young maybe with the odd opposite colour feather here and there. As we don’t know the heritage of the birds there is a possibility that some may turn our a smudgy white or you may even get the odd throw back of a completely different colour. Either way you won’t be able to show them but they will make lovely pets. Enjoy. Hi my cockerel has a large walnut comb & is struggling to eat out of the feeder. Do you have any suggestions about what feeder would be best for him?